We love a good road thriller, where unsuspecting travellers discover they aren’t truly alone in the vast, isolated and smouldering expanses of the American desert – think titles like 1986’s The Hitcher, or 1997’s Breakdown. There’s something about the unique psychological landscape of these films that sees their heart-racing, bone-chilling effects playing on our minds long beyond their hour-and-a-half durations. Luckily, we remind ourselves, we’re safe and comfortable in our homes, at a sheltered distance from the types of weirdos encountered in these remote settings. But what if the danger of the desert followed you home? From William Monahan, the Oscar-winning writer of The Departed, Mojave delivers this unsettling twist on the road thriller genre. Garrett Hedlund of TRON: Legacy fame plays Thomas, a troubled, almost suicidal artist who has an ominous encounter in the desert with a homicidal, chameleon-like drifter. 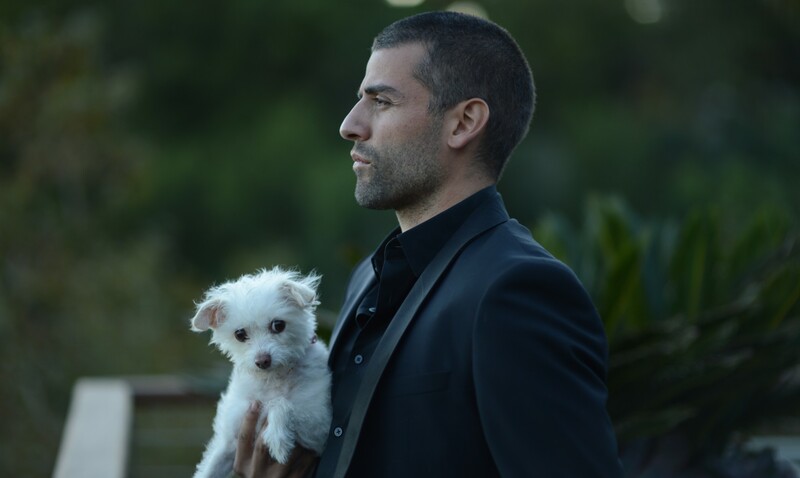 Said drifter is Jack, played by the sensational Oscar Isaac of Star Wars: The Force Awakens and A Most Violent Year, who proceeds to follow Thomas back to his privileged L.A. domain, attempting to infiltrate and destroy his seemingly-perfect life. Here’s our exclusive conversation with William Monahan, Garrett Hedlund and Oscar Isaac about their experience of making the dark new thriller, which also stars Mark Wahlberg and Walton Goggins. Mojave densely weaves together a number of different ideas via its two central characters, Tom and Jack. How would you describe these two men? Garrett Hedlund: [I play] a guy named Tom who’s ultimately driven mad. He goes out to the desert, needing to get away, and ends up going crazy, but also really showing us who he is. Murders are committed. He comes back to L.A., and that’s really where the story starts. For the first chunk of the script, there’s a guy that you know nothing about. No words are really said. Then finally a third of a way into the film you start to unpeel the layers and realise who this person really is. 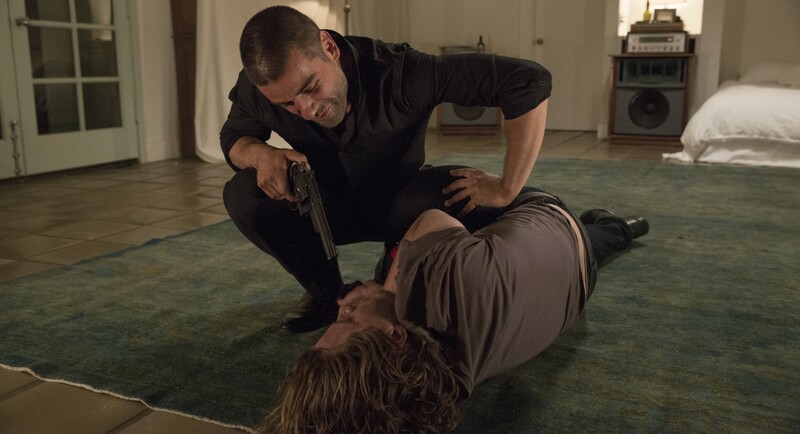 Oscar Isaac: I play the role of Jack, who’s a desert rat, psycho killer in the Mojave Desert. He’s a brilliant man with a lot of potential as a writer, but something went askew at some point in his brain, and so he’s just isolated himself from humanity. William Monahan: Jack is an artist who’s chosen to live in the desert and has also expanded into being a homicidal maniac. The camp itself – including the Airstream he lives in – is a complete expression of his personality and the polymathic nature of his talents. [His home] indicates that Tom is actually his double, so to speak. Someone who if in the script, ‘women and the weather’ had gone a different way, could’ve been in Tom’s position, whereas Tom could’ve been in his. None of us ever really conquers our worse half, it’s always there. There’s a line in a scene where Jack asks Tom, ‘Do you believe in the duality of man?’ and Tom replies, ‘No, I believe in infinite complexity’. That’s more or less where I come down on it as well. The thing about Mojave is it is a film of ambiguities. There is a bit of a question about who the bad guy is, but we’re all the good guy, and we’re all the bad guy. The interaction of the desert setting with Tom’s return to Hollywood is something we haven’t really seen before. Can you tell us more about your interpretation of it? Garrett Hedlund: Oscar and I were sitting down at my place after wrap one night, and I broke down to him what I thought it was in my mind; a guy goes out to the desert to kill the devil inside, and ends up bringing him back with him. Anyone that’s in the [film] industry will know what drove this guy to start off at page one of the script driving at 100mph out into the desert. William Monahan: The most important thing about the L.A. segments is that no one really has anything. Nobody’s really settled in L.A. – they don’t know what they’re doing or why they’re there. They live in unfurnished houses, and there’s a continual existential crisis in every direction. What is your own relationship with the desert as a psychological space? William Monahan: The desert’s always appealed to me, and the idea for Mojave came about ten years ago when I was actually sick of the film industry. I took a 4×4 vehicle and went out into the middle of the Alkali Lake, that we have in the film, and laid back on the hood of the car exactly as Tom does in the movie. But then I tilted my hat to the side and looked at the sun flaring behind the mountains and thought ‘My God! That’s a camera position’. So my attempt to get away from the film industry ended up being Mojave. Garrett Hedlund: You have to get the hell away once in a while and if you don’t it could be damaging for the soul and to others. And that’s exactly what Tom is going through at this moment. He’s very successful, but he doesn’t enjoy it, he doesn’t need it and that’s what you get to see. So Tom blasts out to the desert and once he’s out there – living the moments that you would find ideal – it’s what he went out there for: driving fast, get wasted, camp up, look up at the stars and realise what you want to appreciate in life and what you haven’t appreciated. All of this comes into play piece by piece throughout the film. You realise he might not be a great guy to start with – or be a great guy by the end of it – but you tend to feel for him just because of the degree of mental torture. He ends up coming across a guy that’s a genius – very much an intellectual doppelgänger of himself – who speaks the same language in a very specific way. But they’re so opposite in terms of where that knowledge got them to in their lives. Tom and Jack have such an interesting connection with one another. It’s fiercely opposing, yet almost weirdly symbiotic. What was it like playing off of Oscar? Garrett Hedlund: Oscar is fantastic, it’s the second film we’ve done together [following Inside Llewyn Davis]. We’ve been great buddies for the last five years, so we’ve really been looking for something to do together and it’s been great to be able to have this as a situation – a Bill Monahan script. One of the best things about it is we’re such good friends, playing psychological enemies, but at the same time just two guys you really want to be best friends. At the end of the film when he says, ‘We’re gonna have a drink’, honestly you could do a whole film the two of us sitting at a table having a drink. With Bill’s writing, it’d be a dream situation for me. What was it like working with William Monahan? Oscar Isaac: Bill’s great, he’s just a genius writer. There’s very few movies nowadays that allow for this kind of language to come out of characters mouths. What I could compare it to really is theatre, but even in theatre you can’t compare it to the classics with such poetry. Garrett Hedlund: Working with Bill has been incredible to be honest, I’ve always been such a fan of his work. He’s such a genius, he’s one of the smartest people I’ve met, honestly. The analogies he pulls out the box to describe these particular situations, it can be mythological or biblical or it could simply be a scene for Lawrence of Arabia. That’s where the inspiration came for this particular shot or this particular moment. That’s what he wants to capture and the communication is so unique. I feel I understand it completely, and I love it. Hands down one of the smartest people I’ve met. It’s interesting seeing a film that explores what it’s like to be a filmmaker. How did you first fall in love with film? William Monahan: I was actually a filmmaker before I was anything else. I was always in love with film. There was a moment when I was watching Lawrence of Arabia and it struck me that someone had written it. A couple of day’s later after being thunderstruck by Lawrence of Arabia I discovered a copy of Dylan Thomas’ screenplay for the Doctor and the Devils. So that was the first screenplay I ever read and that was what I worked off of. The screenplay has first of all to be good reading, it has to be a selling tool to get the actors, because if you don’t have the actors, you don’t have a movie.